One of my favorite publications from the Stedelijk around this period. 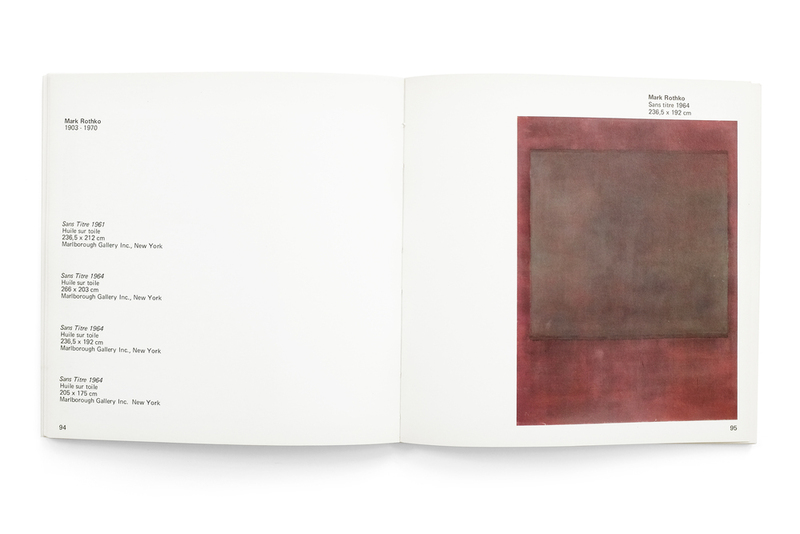 The catalog defies interpretation with no supporting text or explanation of the work present within. The black and white catalog is printed on glossy paper, featuring high-contrast photographs of light and shadows against what appear to be window blinds. 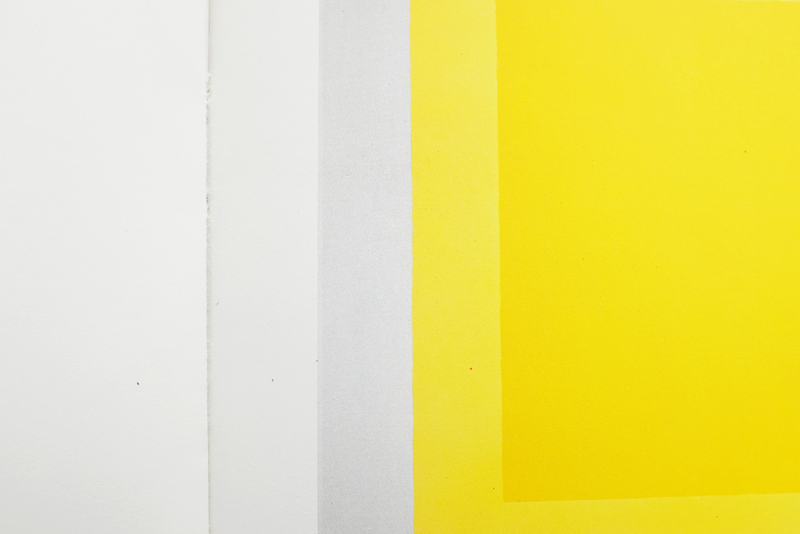 The repetition of the individual films strips contrasts the irregularity of their placement on the page, creating a beautiful rhythm throughout. The variation of the forms on the page animate across the book like a stop-motion film. 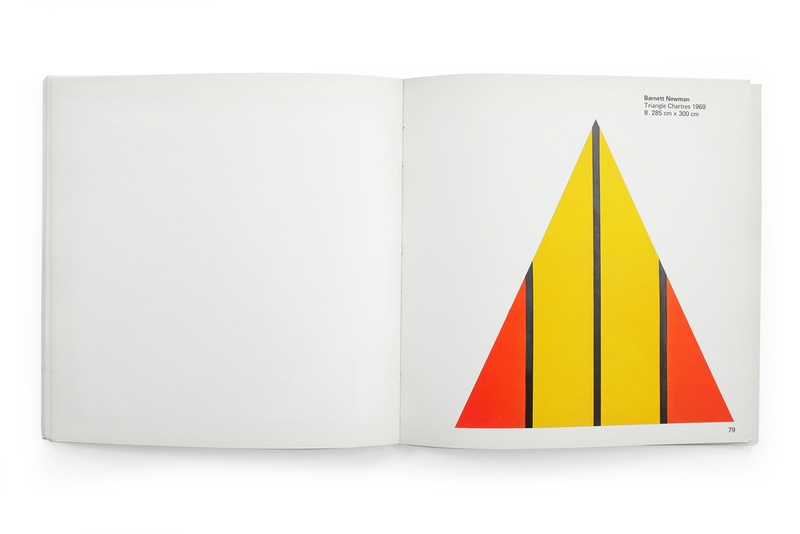 Yellow Curve is easily one of the most beautiful and curious books in my collection, containing indeed one of my all-time favorite spreads from any book (pg. 30-31 featuring Kelly’s Orange and Black Ripe). It stands at 12.5” tall and although it couldn’t be considered a large book, contrasted against its slenderness—a consequence of it being only 64 pages long—it feels monumental. By virtue of its sparse layouts and thoughtful pacing, the reproductions of Kelly’s work reach magnificent heights, capturing a kind of grandeur one feels when physically in front of the originals. The grid and type layout takes its cues from European modernism with clear Crouwelian references. Justified type sit along the margins while the interior column/gutter is reserved for images of Kelly’s work, creating a beautiful juxtaposition of organic, colorful forms against the rigidity of the text block. The typography itself is a confusing blend of Univers Extra Black and Optima Regular, with a result that feels wholly unique and ill-suited for the content. Despite having some of the most thoughtfully arranged spreads I’ve seen, featuring the canvases and sculptures elegantly stretching across the plain white field of the paper, a few of the installation shots are some of the most unprofessional photography I’ve ever seen printed by a publisher of this caliber. Photos appear grainy and lacking any color and light balance. The overall impression of the book is nothing short of bewilderment. I’m puzzled how the same designer, in the same book, has managed to so elegantly arrange type and image in some spreads and utterly butcher them in others. But often the type of creative work which I enjoy the most is the unfamiliar, and that which I don't fully understand. This book fits perfectly within that category. I don’t understand the logic behind it, yet I treasure the artifact as a curious and endearing publication that has managed to engender simultaneous delight and puzzlement. I’m skeptical that I can adequately write anything about this book. For one, I understand very little about what it is documenting. I believe it highlights a famous Polish riverside performance featuring an amalgam of pyrotechnics, theatrical puppetry, and music conducted by the Polish United Workers’ Party over multiple years in the 70s. Secondly, much like the occasion itself, the design of the book is wholly irregular in a fantastical, surreal, and psychedelic way which I doubt I can justly describe. And lastly, I’m also a bit drunk. The book is a beautiful photographic essay unlike anything I’ve seen before. Everything from the use of the ungainly extended Akzidenz Grotesk to the pure CYMK coloration feels radically unique and without pretension. The low-quality, offset printing of the time has created a wonderfully bizarre rendering of Adam Bujak’s photographs while the bold floods of cyan, magenta, and yellow abruptly break the rhythm of the images. Even many of Bujak’s black and white photographs are printed in monochrome shades of alternating colors, furthering the surrealistic effect. The book also comes with a record featuring music from the event. 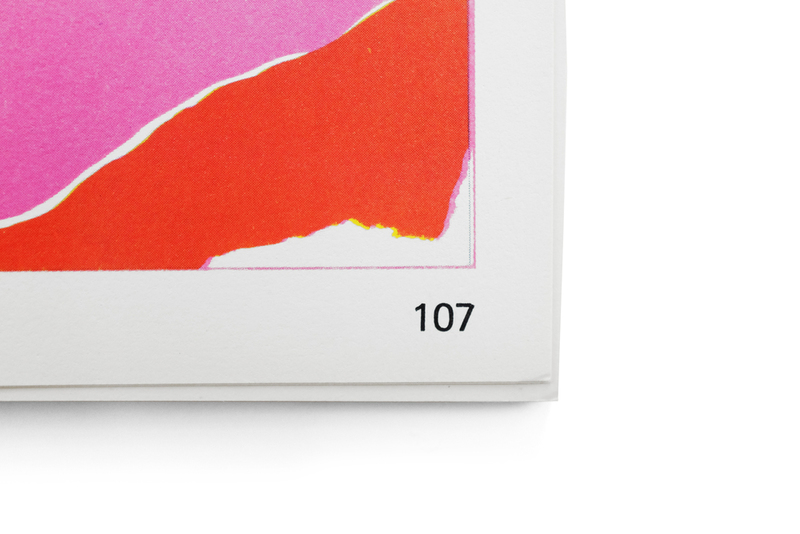 It is packaged unceremoniously in an off-kilter red sleeve that vibrates against the somewhat garish combination of the spread’s magenta and yellow pages. The book was originally derided as a cheap fever dream, showcasing a famed event through a kind of slipshod cacophony of various technical and budgetary limitations, or otherwise inexplicable choices. But the result today is an absolutely beautiful contemplation on the radical design of that era. It transcends its original constraints to create an otherworldly portrait of a bygone event. This is easily one of my most prized books in my collection, not for its value but its exceptional design. Rarely do I come across a work that feels as uninhibited as this. I love a strong front and back cover relationship. This book uses Gill Kayo (the chosen font for the foundation throughout the period) to great effect here. 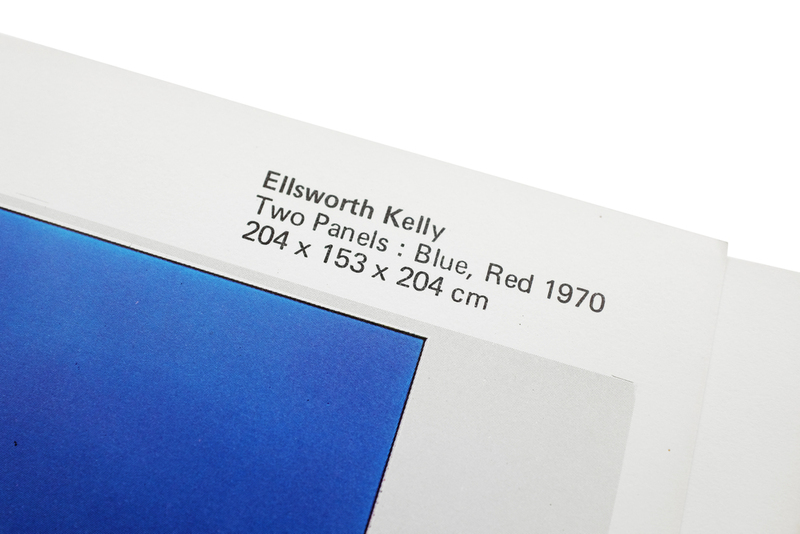 Sitting on a kind of reverse-shadow of itself, the title is reflected on the back with an inverse relationship of the vibrant red and blue as on the front, creating an optical effect that is nothing short of arresting (and somewhat at odds with the formatting inside). 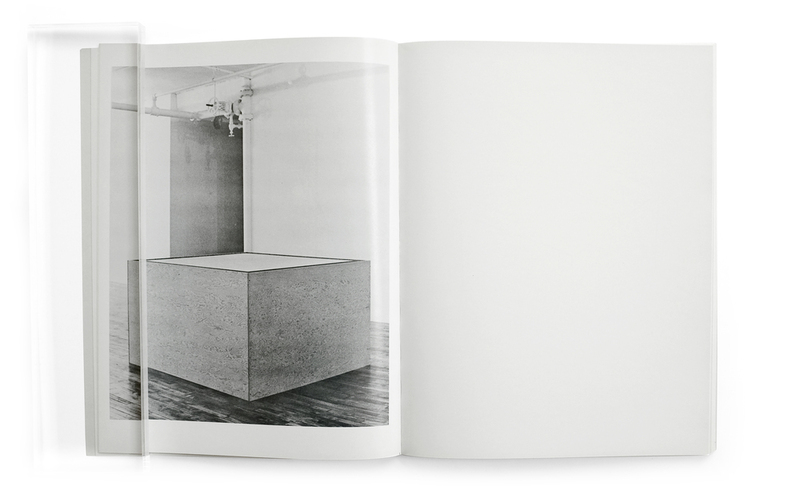 Within, the tone is immediately quieted with a comparatively austere and airy preface typeset in Univers which is handsomely used throughout the rest of this exhibition catalog. The design of the book, with the exception of the boisterous cover, is relatively reserved and straight-forward. What attracts me to it is its beautiful printing, pacing, and generous use of negative space. In fact, at times I see myself reading the negative space of certain spreads before the content themselves, due to the text and image seemingly retreating to the margins in an effort to avoid recognition, or at the very least create as much space as possible in this tiny catalog. Furthering the curious and quaint nature of this text, due to a publisher error, every copy is missing their 13th and 14th pages. Heiner Friedrich, Inc., New York. I consider this to be a very rare example of a perfect book. It's managed to achieve such a status by virtue of its satisfying feeling of completeness and congruence. Completeness in that the content of the book documents and presents the subject in a refreshingly total and holistic way. 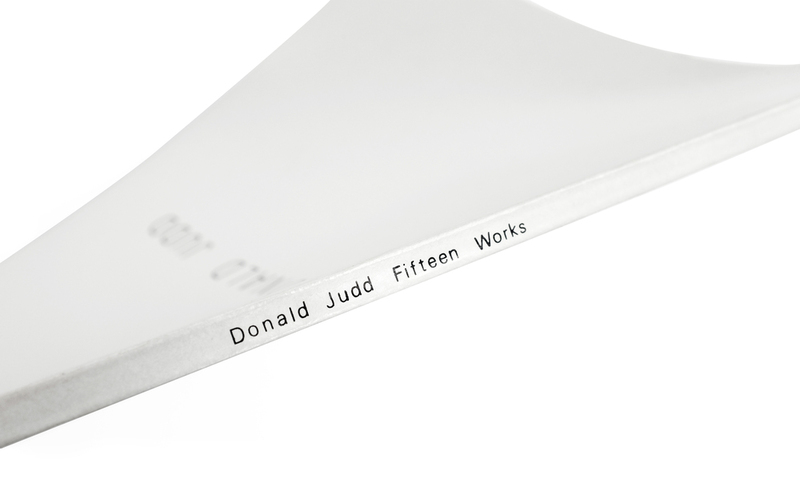 Congruence because the design of the book perfectly embodies the spirit of Donald Judd’s aesthetic and ideology without veering into pastiche. No decision feels out of place, overthought or heavy-handed. I found this book at Printed Matter's NY Art Book Fair a few years back. The Dia Art Foundation, as usual, had a particularly sparse display of catalogs on their table. But this one didn't look familiar. I hadn’t recognized it from years past, nor had I seen it on their site before. It turns out that someone at the foundation had unintentionally discovered a large box full of these old exhibition catalogs from the work's debut at the Heiner Friedrich gallery. And as luck would have it, Dia is now the owner of this series of fifteen plywood sculptures that are shown in this book. So the foundation promptly acquired and began to sell the books—a wholly unique and now somewhat mysterious record of one of Dia’s most prized series of works. I struggle to think of ways I would improve on its design. Much like Judd’s work that is featured within, it lacks all ornament and flourish. The skeletal remains feel refreshingly pragmatic and devoid of any pretension. The printing was unkind to Univers with ink spilling out and across the letterforms, neutralizing the more subtle qualities of the typeface, but in turn creating a kind of utilitarian and rough-hewn quality. In a way it reminded me of the plywood boxes themselves. 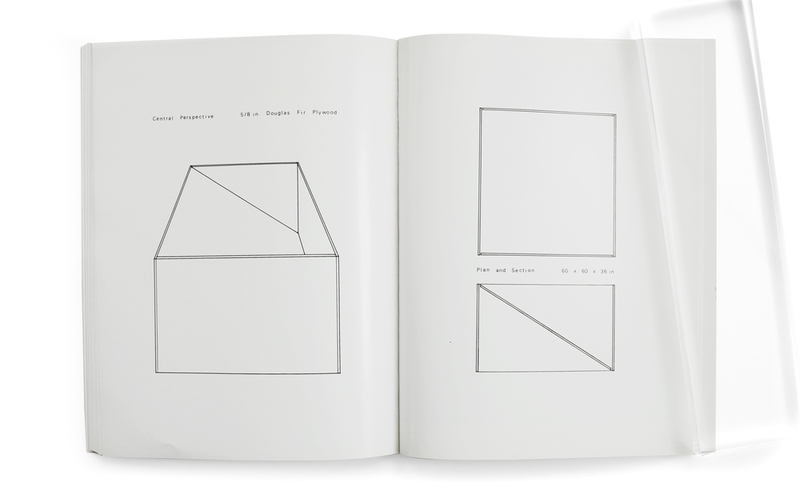 The structure of the book is exceptionally simple. 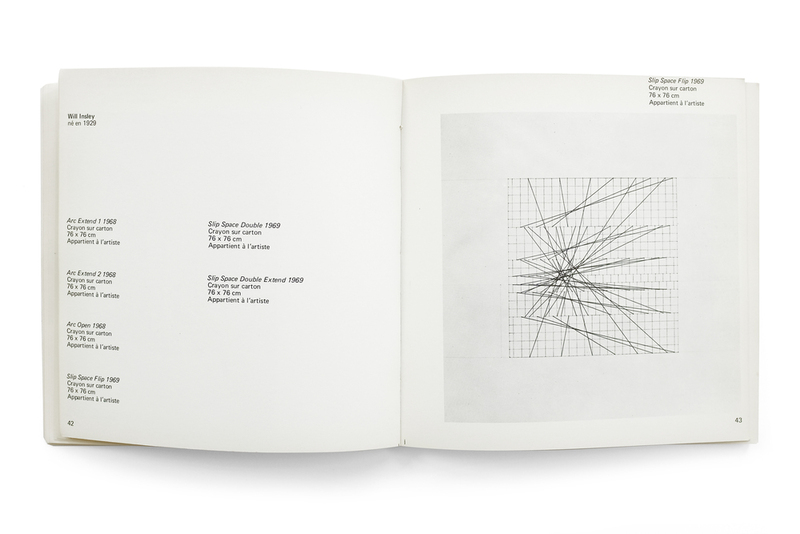 Each of the fifteen works are presented in an identical fashion: a spread is dedicated to an initial isometric sketch by Judd. This is followed by a second spread of technical drawings illustrating the central perspective of the piece as well as the plan and section view, with all accompanying material and dimension information. The final spread is reserved for a single photograph showing the end product: the wooden sculpture sitting unceremoniously in the quiet space of the gallery. The viewer is quickly ushered through the entire series from inception to execution, without any explanatory text. 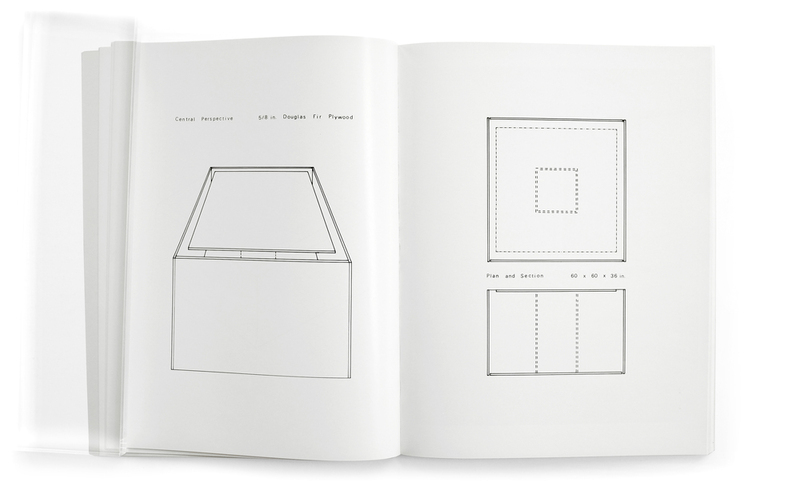 Paging through the book is a methodical and meditative experience. 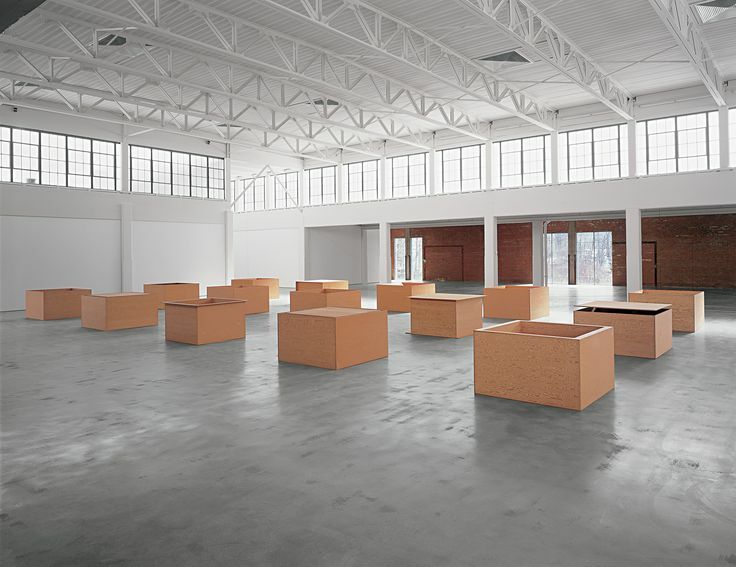 The relationships to Judd’s work are obvious. 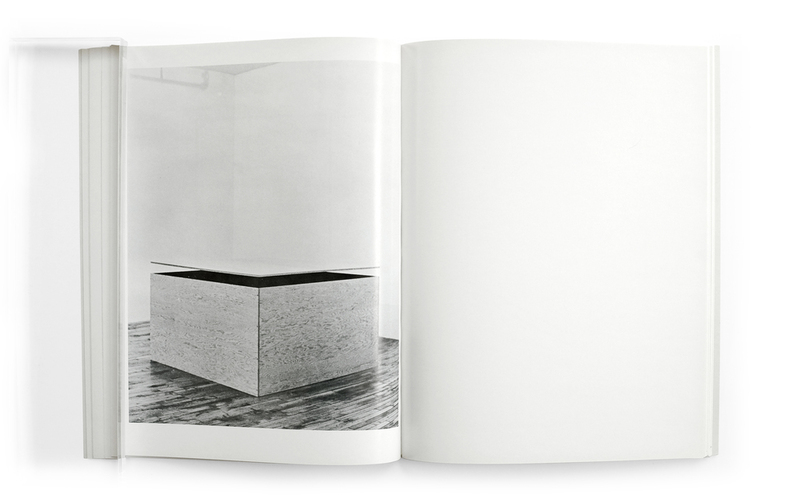 Like his sculptures, the structure of the book is laid bare. Additionally, ample space is provided to the drawings and photographs, asking the viewer to consider both the positive and negative image, exactly like how his sculptures invite you to simultaneously confront the foreground and background, interior and exterior. A lesser designer could have suffocated this humble catalog with gimmicks and effects, overpowering the stillness of its contents. 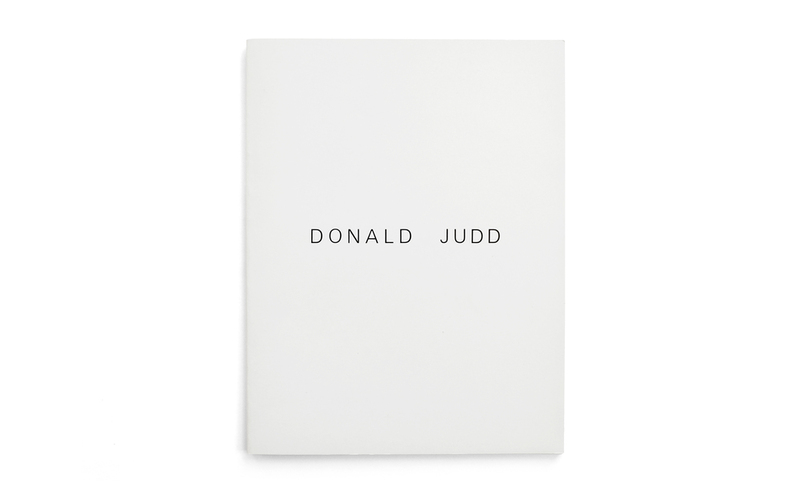 But instead, the anonymous designer has managed to channel Judd to create a catalog that telegraphs the tranquil and unadorned nature of the sculptures themselves.